If you connect to Office 365 Outlook, you can show, send, delete, and reply to email messages, in addition to other tasks. You can add controls to perform these functions in your app. For example, you can add Text input controls to ask for the recipient, the subject, and the body of the email, and add a Button control to send the email. 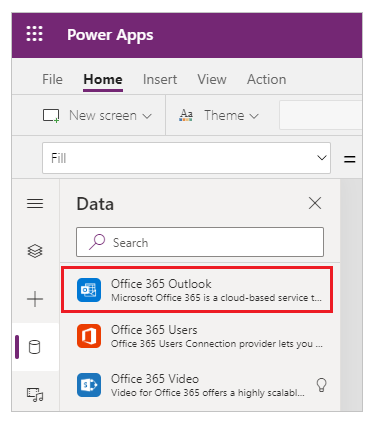 This topic shows you how to add Office 365 Outlook as a connection, add Office 365 Outlook as a data source to your app, and use this data in different controls. As of this writing, the calendar operation doesn't support recurring events. Select Connect, and if prompted to sign in, enter your work account. The Office 365 Outlook connection has been created and added to your app. Now, it's ready to be used. On the Insert menu, select Gallery, and then select a Text gallery control. The gallery control is automatically populated with some of your emails. In the gallery, set the Text property of the first label to ThisItem.From. Set the second label to ThisItem.Subject. Set the third label to ThisItem.Body. You can also resize the labels. The gallery control is automatically populated with the new properties. 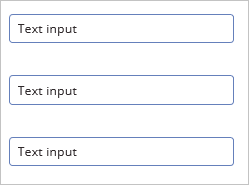 On the Insert menu, select Text, and then select Text input. Move the button so that it appears under all the other controls, and set its Text property to "Send email". Press F5, or select the Preview button ( ). 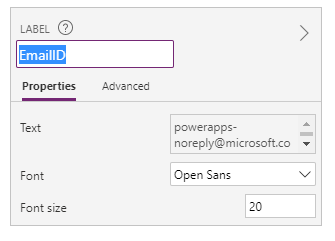 Type in a valid email address in inputTo, and type whatever you want in the other two Text input controls. Select Send email to send the message. Press Esc to return to the default workspace. You can, for example, create an app in which the user takes pictures by using the device's camera and then sends them as attachments. Users can also attach many other kinds of files to an email app. You can specify the @odata.type property for only one attachment, and you can set it to an empty string. In the gallery, set the Text property of the first label to ThisItem.Id. Set the second label to ThisItem.Subject. Set the third label to ThisItem.Body. Press F5, or select the Preview button ( ). Select one of the emails in your gallery, and click the button. This deletes the selected email from your inbox. So, choose wisely. Press Esc to return to the default workspace. This section uses the same controls as Delete a message. Press F5, or select the Preview button ( ). Select one of the unread emails, and then click the button. For a list of all functions and their parameters, see the Office 365 Outlook reference. See all the available connections. Learn how to manage your connections.